A newly downlinked spectral observation of Pluto’s moon Nix from NASA’s New Horizons spacecraft provides compelling evidence that its surface is covered in water ice, similar to what the New Horizons team discovered recently for another of Pluto’s small satellites, Hydra. This new result provides further clues about the formation of Pluto’s satellite system. With this observation by New Horizons’ LEISA – the compositional spectral imager aboard the spacecraft – mission scientists also are piecing together a more detailed picture of Pluto's system of four small, outer moons (Styx, Nix, Kerberos and Hydra). 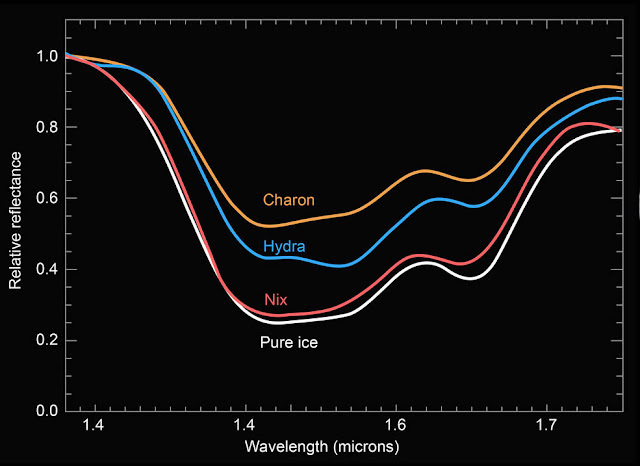 The deeper spectral features on Nix seen in the graph above are a signature of water ice that is relatively coarse-grained and pure, because the shape and depth of water-ice absorption depends on the size and purity of the icy grains on the surface. Scattering from smaller, or less pure, icy grains tends to wash out spectral absorption features, making them shallower. The difference in the depths of the water ice absorption features in the Nix and Hydra spectra raises new questions. Specifically, the science team is puzzling over why Nix and Hydra apparently have different ice textures on their surfaces, despite their similar sizes. 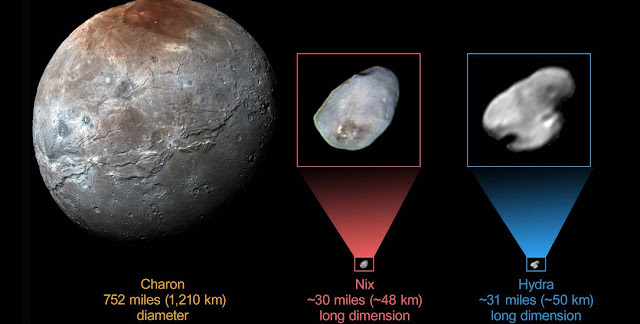 Another mystery resulting from the Pluto flyby data is why Hydra’s surface reflectivity at visible wavelengths is higher than Nix’s – a New Horizons result published in March in the journal Science – even though Nix’s surface appears to be icier, implying higher reflectivity at visible wavelengths. The LEISA Nix observation was captured on July 14, 2015, from a range of 37,000 miles (60,000 kilometers), resulting in a spatial resolution of about 2.3 miles per pixel (3.7 kilometers per pixel).